Pyongyang, February 9 (KCNA) -- A grand military parade for celebrating the 70th founding anniversary of the Korean People's Army was held at Kim Il Sung Square in Pyongyang Thursday. Kim Jong Un, chairman of the Workers' Party of Korea, chairman of the State Affairs Commission of the DPRK and supreme commander of the Korean People's Army, arrived at the square together with Ri Sol Ju. 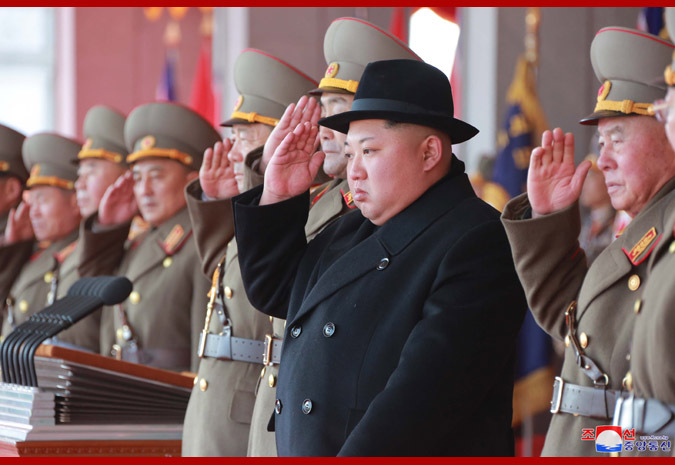 A ceremony of the guard of honor of the KPA three services took place to greet respected Supreme Leader Kim Jong Un. When he appeared at the platform of the square together with Ri Sol Ju, all members of the parade burst into cheers of "Hurrah!" looking up to him, and chanted slogans "Kim Jong Un" and "Devoted Defence". The Supreme Leader waved back to the participants in the parade and the crowds. Taking the platform were KPA Vice Marshal Kim Jong Gak, director of the KPA General Political Bureau, KPA Vice Marshal Ri Myong Su, chief of the KPA General Staff, Army General Pak Yong Sik, minister of the People's Armed Forces, and other commanding officers of the General Political Bureau and the General Staff of the KPA and the Ministry of the People's Armed Forces and commanders of large combined units. The box of the platform was taken by Kim Yong Nam, member of the Presidium of the Political Bureau of the C.C., Workers' Party of Korea and president of the Presidium of the DPRK Supreme People's Assembly, Choe Ryong Hae, member of the Presidium of the Political Bureau of the C.C., WPK, vice-chairman of the State Affairs Commission of the DPRK and vice-chairman of the C.C., WPK, and Premier Pak Pong Ju, member of the Presidium of the Political Bureau of the C.C., WPK and vice-chairman of the State Affairs Commission of the DPRK. It was also occupied by leading officials of the party and government. Taking the tribune of honor were officials of the party, armed forces and power organs, working people's organizations, ministries and national institutions, officers and men of the Korean People's Army and the Korean People's Internal Security Forces, teachers and students of Mangyongdae Revolutionary School and Kang Pan Sok Revolutionary School and officials of industrial establishments and persons of merits in Pyongyang. Present there on invitation were overseas compatriots and diplomatic envoys and their spouses, military attaches and their spouses here and other foreigners. The guard of honor of all the services of the KPA and the combined military band of the KPA began the opening ceremony. The flags of the DPRK and the WPK were hoisted. The commanding officer of the military parade reported the minister of the People's Armed Forces of the DPRK that the military parade units have lined up to get inspection for parade celebrating the 70th birthday of the KPA. The minister of the People's Armed Forces inspected the parade units, congratulating them on Feb. 8 holiday. Then he reported Marshal of the DPRK Kim Jong Un that the military parade would begin. A signal trumpet for the start of the military parade was sounded and a 21-gun salute boomed. Kim Jong Un made a congratulatory speech. Cars carrying the flags bearing the portraits of smiling President Kim Il Sung and leader Kim Jong Il entered the square, being escorted by generals and officers of the KPA. The guard of honor of all the services of the KPA and all the members of the military parade paid high tribute, looking up to the flags bearing the portraits of Kim Il Sung and Kim Jong Il. Then the military parade began. Columns symbolic of the period of building the regular armed forces took the lead. Then led by a car with the commanding officer of the parade aboard, columns of the three services, corps-level units, arms, specialists and army surgeons marched past the square. Fighters in the formation of number "70" flew past the sky above the square, letting off fireworks. The columns of mechanized units, strategic forces units, Hwasong artillery men marched past the square in fine array. Fighters left a trail of the shape of a five-color fan to specially decorate the end of the parade. When the parade ended, thunderous cheers of "Hurrah!" reverberated far and wide, fireworks were displayed and balloons were let loose. Kim Jong Un stepped to the balcony of the platform and acknowledged the enthusiastically cheering crowds. The military parade for celebrating the 70th anniversary of the KPA demonstrated the faith and will of the Korean army and people to further consolidate the DPRK as the invincible fortress of socialism and bring earlier the final victory of the Juche revolution.